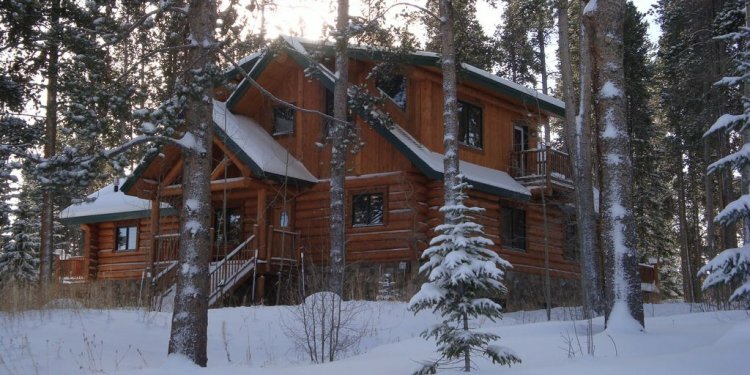 River Ridge Rentals is pleased to introduce you to the Bear Creek Cabin. Nestled among the pines and bordering national forest is Breckenridge, a true Colorado luxury mountain cabin. The views are breathtaking from every room in the house of the Ten Mile Range, Baldy Mountain and the Rockies. Situated on 1.5 acres and bordered by national forest and a stream you will find that this is a special escape and what a mountain vacation should be. Despite the feeling of seclusion and tranquility the Town of Breckenridge and Breckenridge Ski Area are only 3 miles from the property! This custom built log home is truly a sight to see. You will be amazed at the natural beauty of the log frame and vaulted ceilings. Locally milled tongue and groove indoor wood further accentuate the peaceful feeling of being in Colorado. The main level of this home boasts an open plan living room, dining room, and kitchen. The living room has a true wood burning fireplace, flat screen tv, BluRay/DVD player, surround sound, and comfortable seating to relax after a day outdoors. The gourmet kitchen has everything that you need to cook and even the most discerning chef will enjoy cooking here. The dining has potential seating for 8 with an additional 3 bar stools at the breakfast bar. There is a powder room bath on this level for your convenience. In addition there is a large deck looking toward the west to enjoy our amazing Rocky Mountain Sunsets. The downstairs has a custom log pool table, flat screen tv, and 1/2 bath. There is a pull out queen sofa on this level and a gas fireplace. There is also a mini bar with cocktail refrigerator, and dishwasher. In addition there is a powder room bath for use when entertaining or using the hot tub. On the exterior of this property is a private outdoor hot tub for your relaxation. There is also a barbeque grill on the spacious deck off of the kitchen. There is a gas powered outdoor fire pit, but please note that this is not available during times when there may be snow as it gets buried due to the snow plowing that occurs. All four of the spacious bedrooms come with private bath, flat screen TV, Blu Ray/DVD player and all of the comforts for you to enjoy in this mountain paradise. Come to Breckenridge and enjoy a stay at this amazing Colorado cabin. Master Bedroom #1 - Canopy Room (2) - a custom canopy king log bed, gas fireplace, clawfoot bath tub and separate shower. Master Bedroom #2 - Pine Cone Room (2) - a custom king log bed, and a 3/4 bath with shower. Coffee maker in between the rooms for those early risers! Master Bedroom #3 - Main Master (2) - a custom king log bed, gas fireplace, oversized bath tub, and separate shower. There is access to the main deck, which you can descend a staircase down to the hot tub. Bedroom #4 - Bunk Room (6) - a custom queen log bed, 2 sets of twin bunks, and a private bath with bath tub.